NOW SHIPPING. Ships to US addresses only. International customers - inquire at your local quilt shop. We're celebrating again! Thanks to the support of our awesome fans, we're bringing back the spirit of Patrick's Quilting Celebrations magazine, with a new look and title and published in-house at Patrick Lose Studios. 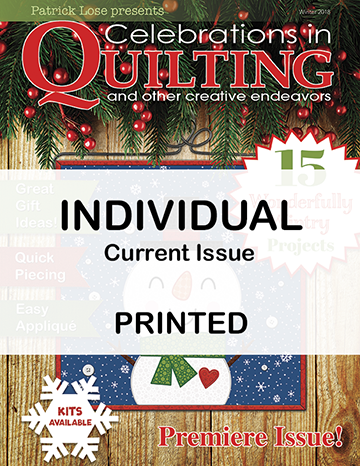 Here's a sneak peek at the cover of our premiere issue of Celebrations in Quilting - and other creative endeavors. Please ask your local quilt shop to carry Celebrations.